In 2018, it was all about taking risks when it comes to graphic design. This year, it’s all about bold color, futuristic play and a new color minimalist approach. Color is turning up a notch this year with splashes of electric yellows, bright corals and vivid blues. Vivid colors, by definition, include lighter hues that are intense or attention grabbing. In addition, as brands proceed to fight for our attention, they must take bigger design risks. Note: you don’t have to only use vivid colors. In fact, mixing those colors with stronger or flatter colors will help you stand out as well! Over the past few years, we’ve seen bold fonts and typefaces become the norm – making it easier to read over social media feeds and mobile devices. In the past, the bold font is often the supporting partner to the other design elements. This year, the bold font will become the main focal point (less design in the back – more focus on type). It’s time the design is now reflecting that. Futuristic patterns, textures and colors define branding with this new concept. Paired with vivid colors, futuristic design became a work of art that sticks in people’s minds a lot longer than a regular ol’ design. Plus – they look great on your iPhone or Mac screen! Have you noticed companies are adding light and dark options on their apps? Or, embracing light and dark color schemes across different devices and avenues? For example, Facebook just added a darker mode to its Messenger platform. This works well on digital devices as well as on print. For print, the light/dark color scheme makes a poster, for example, a lot more flexible, so you can hang it against a dark or light wall. Another great mobile-approved design, gradients are making a comeback. 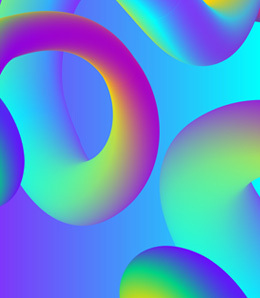 With their vivid colors and futuristic patterns, they feel right at home with some of the other graphic design trends of 2019. This year, though, gradients are predicted to be used as more than just a backdrop. It can be used across entire images, for example and become a visual strategy to become apart of a brand. It’s a simple way to differentiae from the competition that even the most novice designers can emulate. Duotones – In simplest terms, duotones are images that replace the whites and blacks in a photo with two colors. Duotones are great because you can make almost any image match your company branding. Minimalism goes far beyond just black text with a white background – minimalism is about pairing down design to only the necessary components. It’s seen as the rejection of complicated or cluttered ideas. Most people interpret that as using muted and neutral color palettes. This year, some of the more complex graphic design trends are going to mix with traditional minimalism to create a new type of minimalism – one that is dominated by color and creativity, instead of blandness and conformity. Hand-drawn means no one else can exactly replicate what you’re doing. It’s authentic and helps you stand out from the crowd. Flat design, however, will no long cut it. It’s time now to take it up a notch with custom illustrations. Custom illustrations also inspire people to be themselves. Take notes from Mailchimp, Slack and Asana for their amazing innovations. When you hear the words ‘stock photo’, do you cringe? Stock photos have been coming around due to the demands of a more real and genuine approach to marketing. Overly edited photos are also out this year; readers really want more genuine and authentic photos of real people – reflecting themselves. Ultra-generic photos should be avoided. Shoot for photos that help you tell a visual story, instead of just filling an open space on your blog or social media feed. In 2019, strive to be less generic, more weird, unique and genuine with visuals! This article was excerpted from Venngage’s The 8 Biggest Graphic Design Trends That Will Dominate 2019.